Oldies Rock and Roll from the 50's & 60's music, photographs and biographies are on the following photo pages which are graphic intensive, so please be patient. There are links to the performers web pages and will soon have links to hear their music. Jody began his career playing the guitar in the Los Angeles area with his group, the Storms. In early 1958 he recorded a song on Demon Records, "Endless Sleep". His follow-up to that giant hit was "Fire of Love". Al Casey was the guitarist on Jody's hits. Jody, a native Californian, still resides in the Palm Springs area. Johnny was an original Mousketeer on the Mickey Mouse Club. He co-starred with Chuck Conners on the Rifleman TV series in the early sixties, as Chuck's son Mark. He began his recording career in 1961 on the Del Fi label. His hits included, "Daydreams", "Patti Ann", "Cindy's Birthday", "Your Nose Is Gonna Grow", "Rumors", and "Mr. Blue". Johnny is the orchestra leader of a big band in Southern California. Jerry hails from Kansas City, Missouri, but has called California his home for the past forty years. Jerry's first major hit was "How The Time Flies" in 1958 on Challenge Records. That record Company was owned by Gene Autry. His next hits were, "Diamond Ring", "Primrose Lane", "Little Coco Palm", "There She Goes", "Life's A Holiday", Shutters and Boards", and "In The Misty Moonlight", which challenged the British Invasion music in 1964. Kathy, a native of Long Beach California, charted with a Rock & Roll ballad that has become a Rock & Roll standard, "A Thousand Stars". Kathy's back-up group was the Innocents. Sandy Nelson was the drummer in that session. Her follow-up hit was "Happy Birthday Blues". She also recorded with the Innocents on a novelty song titled "Kathy Young Finds the Innocents Guilty". Their group was named Washer Windshield. Today Kathy lives in Sherman Oaks, Ca. 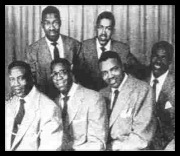 The Philadelphia based group had their first National hit in 1957 with a song tiled "Peanuts". Joe Cook, the lead singer was the author of that song. It was released on the Okeh Record label of New York. Today Joe is still active in the music business. He resides in Massachusetts. Lonnie, a native of Indiana recorded a song written by Chuck Berry. That song was Memphis which reached # 3 on the Pop Charts in 1963. Lonnie's next mega hit was "Wham". Lonnie has made frequent appearances on Saturday Night Live. Lonnie & his wife reside in Nashville. Robin, a native of Hawaii, had a major hit in 1957 with Susie Darlin'. Robin continued his recording career through 1961. Dr. Luke is now head of administration at Southwestern Missouri State University, in Springfield, Mo. In 1953, Marvin Phillips began singing with Jesse Belvin as Jesse & Marvin. They had a hit song on Specialty Records that they had written called "Dream Girl", that hit the TOP TEN on the R&B charts. Jesse & Marvin went their own ways that same year. Marvin teamed up with Joe Josea and became known as Marvin & Johnny. in 1954 they wrote and recorded a hit song titled "Cherry Pie" and had another hit with "Tick Tock", both hits coming on the Modern Label. They both live in California. Mel, a Cincinnati Ohio native had his first national hit in 1965 with "Hold Me. Thrill Me. Kiss Me". That song reached # 1 in June 1965. His next major hit was, "All of A Sudden My Heart Sings", in October 1965. Today, Mel lives in Southern California.